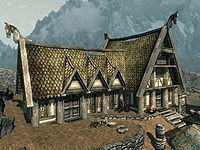 The Bannered Mare is an inn located in Whiterun's market area in the Plains District. The inn has two stories split into multiple rooms. On the first floor there is the common room, a small bedroom, and the kitchen. The second floor contains three bedrooms split across two areas. 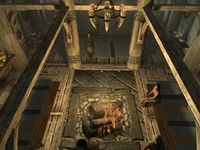 Sitting in any seat in the inn will cause Hulda to call Saadia to serve the player, and she will then seek out the player and offer to sell food and drinks. Argonian Ale Extraction: Brenuin longs for the taste of Argonian Ale. Can you steal some for him? Breaching Security: Kill and frame the son of a high-ranking Imperial guard. Dampened Spirits: Put Maven Black-Briar's competition out of business. Hail Sithis! : One of the biggest contracts in Brotherhood history is yours to fulfill. Pets of SkyrimCC: Find trained pets around Skyrim. It is by the stairs leading up to the Gildergreen tree. There are stone steps leading up to the main entrance, where there is a Loot shadowmark carved into the wall to the right of the entrance door. There is a wood chopping block next to the rear entrance that takes you directly into the kitchen. Once you have completed the special Thieves Guild quest: Imitation Amnesty, there is a thieves cache barrel behind the inn, which is marked with the Cache shadowmark carved into the side of it. The common room centers around a fire pit in the middle of the room, next to which are two benches and a chair. Mikael stands next to the chair when performing, and any of the town's residents may dance while he performs. Sinmir will stay in this area, alternating between sitting, standing, and occasionally dancing. On either side of the front door are small tables with three chairs. There is another table and two chairs against the south wall and another against the north wall. Just past the entrance to the kitchen area are two more chairs. In the southeast corner are two chairs, where Uthgerd sits. On this table is a letter from Maven to Christophe. Everything on the tables around the common room is displayed merchandise for sale that can be bought or stolen, except the plates, goblets, bowls and a gourd. To the south of the fire is the bar with two stools with Hulda leaning on the counter. Behind the bar there are two cupboards holding a potion of minor stamina*, a mammoth tusk, a sample of fly amanita*, and a leather strip as well as more items for sale that can be stolen or bought. There are a couple of food barrels against the west wall with an unlocked chest containing leveled items between them, while against the east wall is a narrow table holding an iron sword and more Displayed Merchandise. Hanging from a beam behind the counter are two bunches of elves ear, a bunch of frost mirriam, two garlic braids, a rabbit and a pheasant. Everything on the counter is displayed merchandise, except for a small coin purse. Under the counter is a copy of Fall from Glory. The eastern main floor bedroom consists of a single owned bed in the southeast corner, with an end table beside it holding a plate, bowl and goblet. Opposite the doorway, against the east wall is a small cupboard containing clutter, with a low table and chair in the northeast corner and a wardrobe containing clothes against the west wall. The kitchen consists of a fire pit with a cooking spit over it against the west wall. A second entrance is to the right of it. A table and two chairs are in the northwest corner, with wall shelves holding plates and other clutter above it. Against the south wall is a set of shelves holding more displayed merchandise, with several food sacks on top. 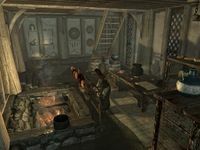 In the southeast corner is a food barrel with a cupboard to the left against the east wall holding more items for sale and the unique Argonian Ale, which is required for a quest received from Brenuin. To the left of the cupboard is a table. On the table is the business ledger, an apprentice locked strongbox containing random items and various items displayed for sale. Rising from the northeast corner along the east wall is a flight of stairs that lead to the top floor, with several barrels and sacks of foodstuffs underneath them. At the top of the stairs there is an landing with a small wardrobe against the west wall. To the north is a wooden door into Saadia's room. It consists of an owned single bed in the northeast corner, with an end table and washbasin beside it. At the foot of the bed against the north wall is a wardrobe, with an unlocked chest containing leveled items on top of it. To the left of the door as you enter is a small square table and two chairs, with a small coin purse on the table. The southern bedroom is Hulda's. It consists of a single owned bed in the southeast corner, with a copy of Thief of Virtue under the bed. To the right is a chair and an end table. At the foot of the bed against the south wall is a narrow table, with a lute and a couple of cups on top. Against the east wall is a dresser with a drum and some pottery on top. If you chop wood for Hulda, her bed becomes usable along with the rentable one. In the northeastern corner of the common room there is a flight of stairs, with crates and sacks under it, leading up to the rentable room in the establishment. At the top of the stairs is a small landing with a cupboard in front of you and the door to a bedroom on your right. There is a large double bed against the west wall, with an end table to the right and a doorway to a balcony overlooking the common room to the left. A second end table is to the left of the doorway to the balcony and opposite against the east wall is a dresser, with a washbasin to the left. On the balcony is a cupboard against the south wall and a low table and two low chairs to the north. The following items are sitting out in the store, on the store counter, in the cupboards behind the counter, on the tables around the common room, and even in the kitchen. They can be purchased from the merchant, or can be stolen. Other items may also be present in the store, but those other items are not available for purchase. They respawn after ten days. This is the merchandise found in the inn's merchant chest. These items are only available if purchased from the merchant; they cannot be pickpocketed or stolen. They are restocked every two days. There is a Loot shadowmark to the bottom right of the entrance door. There is a mammoth tusk, two unlocked chests, a strong box, and many food items in the store. The store also contains the unique Argonian Ale, found on the kitchen cupboard. 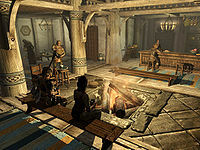 Selling firewood to Hulda makes low value items freely available, including use of the two beds (Hulda's and rentable) which will then grant the well rested bonus. The items marked with "*" become displayed merchandise, once you have the Merchant speech perk. All containers in the area, with the exception of some barrels and food sacks, are non-respawning. You may only need to pay for the rented bed once, as it does not always revert to being owned after 24 hours. You cannot sit on the bench nearest the counter. Sometimes Rexus will not be here but will still be in Volunruud. Sometimes when you run into Mikael while he plays on his lute he will put away his lute, but you will still hear it. 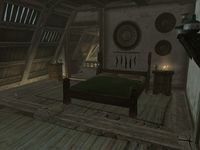 If both Saadia and Hulda are dead and you've married Ysolda you can sleep in any of the owned beds despite them being tagged as such. ?